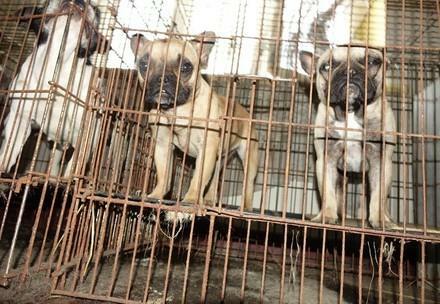 The illegal puppy trade is rife with animal cruelty, deception and risk of disease. FOUR PAWS has revealed widespread problems in the trade through our investigations, research and campaigns. 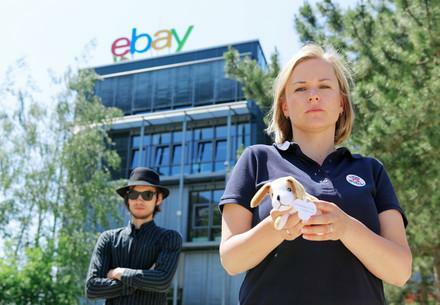 The main channel to market for the illegal puppy trade is online classified ad sites. These sites provide sellers with easy access to a significant pool of potential buyers. Due to the anonymity provided by such platforms, international puppy traders use them to sell illegally imported puppies without much threat of being identified and prosecuted. Traceability is a key issue across the illegal puppy trade. Often puppy dealers disappear once the sale has been made online, leaving the victims of the trade (pet buyers) to deal with sick animals and high veterinary costs. There is no legislation currently in place across the entire European Union that tackles this problem. The EU Animal Health Law (AHL) presents an unprecedented opportunity to eliminate the illegal puppy trade. The AHL will apply in all EU member states from 21 April 2021. The overall aim of the AHL is to provide prevention, protection and control measures against transmissible animal diseases. The AHL requires that all sellers and breeders, transporters and assembly centers of dogs, cats and ferrets to register their establishments with the national government*. 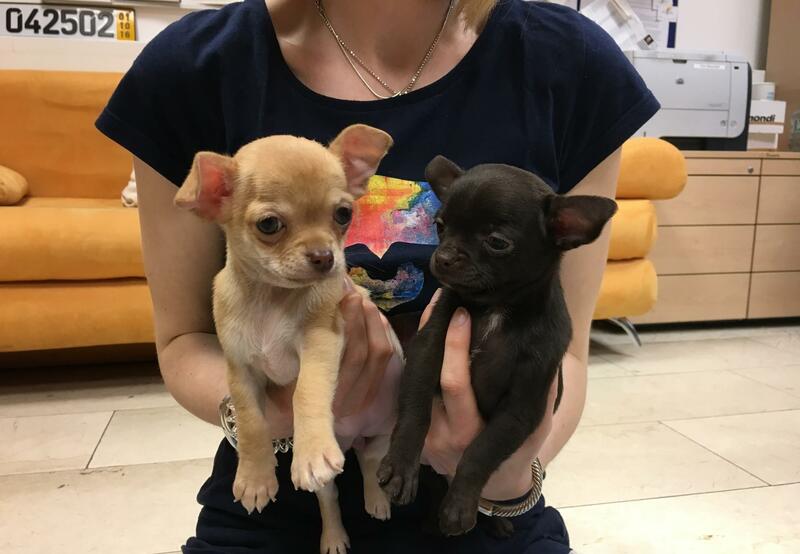 This is a turning point towards phasing out the illegal puppy trade because the AHL provides traceability of all breeders and sellers establishments; this is important because it also helps to provide a way of identifying unscrupulous sellers and breed. The AHL can also help to address the illegal online trade because it provides transparency. The way in which this can be achieved is for the national governments to create digital national establishment registration databases and for registrations numbers to be allocated to all breeders and sellers who register their establishments. Classified ad sites should be legally required to verify the registration number via the registration database before an ad goes live. If a seller is not registered, they should ideally not be allowed to sell online. Registration should be made as simple as possible and cover both private and commercial sellers. Most unscrupulous sellers/breeders will not want to be register their establishment because it means that they can be identified and traced. This system would provide a very good starting point for traceability of breeders and sellers helping to reduce the illegal online puppy trade. However, a further step to address the illegal online puppy trade would be to link national establishment registration databases with national identification and registration (pet microchip) databases. By linking these databases, full pet and seller traceability can be achieved. For example, it would be easy to see which animals are from which breeding/seller establishment. This will enable enforcement agencies to quickly identify how many sick or illegally imported puppies are linked to which breeding/seller establishment. Action can then be taken to address the situation. An international entity, which collects the information from national I&R databases (such as EuroPetNet), could set up an interface to provide a checking service to all classified ad sites across Europe. This could include checking that both the animal and seller are registered and that the animal is registered to the seller as the current owner. With this interface the classifieds can verify if the sellers’ stated information such as transponder number, age, breed and country of registration are correct. Only after this verification process should an ad go live. To make individual pets fully traceable, it is crucial that animals are microchipped and registered on a national Identification and Registration (I&R) database by a vet. 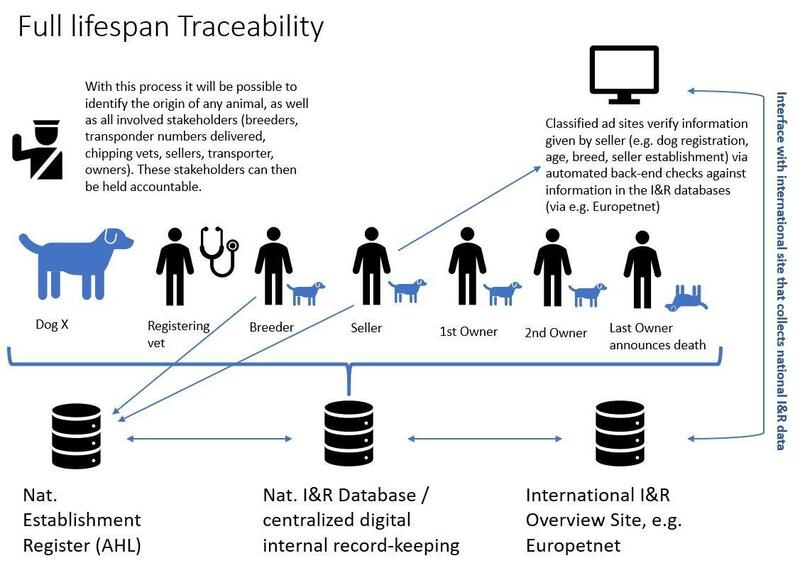 To facilitate full traceability there would need to be a legal requirement for these databases to include data covering all the stakeholders involved in an animal’s life: the breeder, the seller, the transporter (ideally including their status and registration number as specified under the AHL) and the microchipping vet. Only then, will competent authorities be able to find out the origin of every sick animal, as well as the whereabouts of any stakeholder involved with that. With this system we could finally achieve EU-wide full traceability of pets and exclude illegal puppy dealers from the market. This would be a critical step for disease prevention, consumer safety, protecting both animal and public health!